I wasn't too thrilled to be starting a press trip to Jamaica with a required 6am Sunday arrival at JFK, but it has given me time to review the state of air travel and suggestÂ youÂ think Code Orange for your next family vacation. I wasn't too thrilled to be starting a press trip to Jamaica with a required 6am Sunday arrival at JFK, but it has given me time to review the state of air travel and suggest you think Code Orange for your next family vacation. Sunday morning is not usually the busiest time to be at New York's largest airport, but in fact, with so many cutbacks in flight schedules and routes, it seems that all of American Airlines' flights to the Caribbean begin here, then get fanned out to the islands via Miami Dade International Airport or other gateways. Thus, the new and beautiful American Terminal 6 at JFK was packed with travelers. Since international travelers cannot check in online, I waited my turn to use the electronic checkin kiosks and swipe my passport. An AA agent was on hand to assist way too many of us and the snaking lines at the check-in-with-luggage desks made the whole operation look under-staffed. The good news is that the new American terminal 8 has a full-fledged Juan Valdez Coffee shop selling the delicious ice coffee I had come to love on a recent trip to Bogota, Colombia, home of the famous cafetero Juan and his fabulous express-cafe chain. The bad news is I didn't have enough time to try it. By the time I reached security dragging my hand luggage, I had spent 35 minutes printing out a boarding pass. I had my laptop and small handbag separate, plus an upright roll-aboard, and the TSA agent made it very clear that I was not getting into the security line unless I compressed the three items into two. Once done, I passed through fairly quickly, somewhat surprised that my forgotten, half-full water bottle made it through the scanner without comment. – to accommodate older kids and coffee/snacks, approximately 75 minutes. – to accommodate infants and toddlers – judging by the speed of the "family" security line designated by TSA for parents with strollers and other slow-moving appendages, this requires at least 90 minutes. The flight to Miami was uneventful and smooth nappping, nice flight crew. 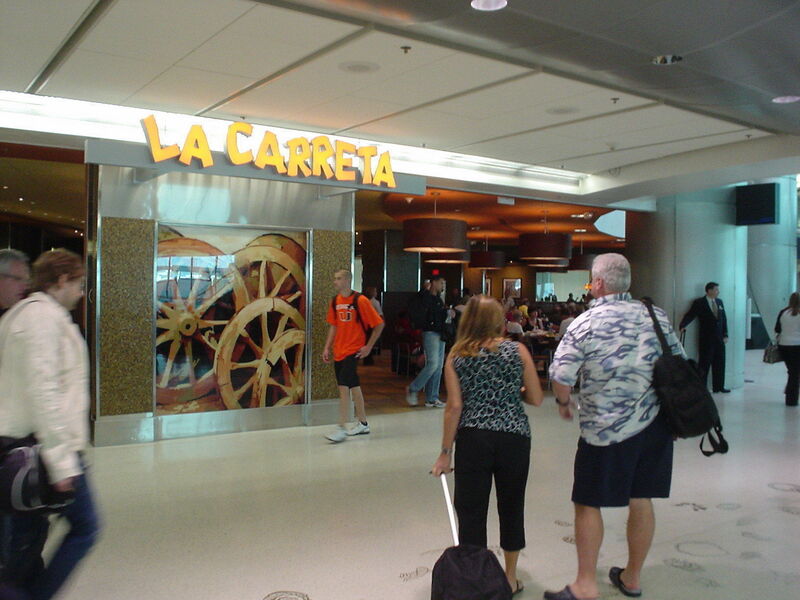 Upon arrival in Concourse E, I was delighted to learn that my favorite restaurant, La Carreta from the concourse between D and E, had opened another branch inside security opposite Gate 36 in Terminal D. (And there are more throughout the airport.) Having missed Juan Valdez, this was my destination. Bravo airport concessionaires for making my travels much more convenient and fun. At La Carreta, I had some croquetas and cafe con leche, plus sitdown with laptop time, then moved to the neighboring gate where Samsung power stations enabled me to plug in and get some juice-burning work done before the flight. All good until I got on the next American line for the Montego Bay flight. There, the gate agent would not let me show my passport and boarding pass until I fit the upright rollerboard into her "carry-on limit" metal frame. She wasn't interested that I had just gotten off another American flight with it. The wheels got stuck putting it in, probably because of the expansion caused by the handbag I jammed into it during the earlier brush with TSA. I dutifully opened up my bag while others continued to board, restored my handbag to my shoulder and slid it in to the sizing station. "Is this all about American getting another fee by making me check a bag?" I asked the AA agent. "No," she answered, "It's a new FAA regulation and all the airlines are doing it." Hmm, with a hodgepodge of restrictions on sharp items, liquids, shoes, metal, electronic devices, jackets, and more, do we really need a new regulation to challenge carry-on luggage? The good news is that my flight to Montego Bay was packed with newlyweds (mostly happy) from all over the country, on their way to honeymoon or — shall we say — to enjoy their first family-making vacation. And even better was the warm sun, mento band and very friendly security awaiting us at the Mo'Bay Airport. Prev Article Prev Article Are Your Healthy Habits Making You Sick?